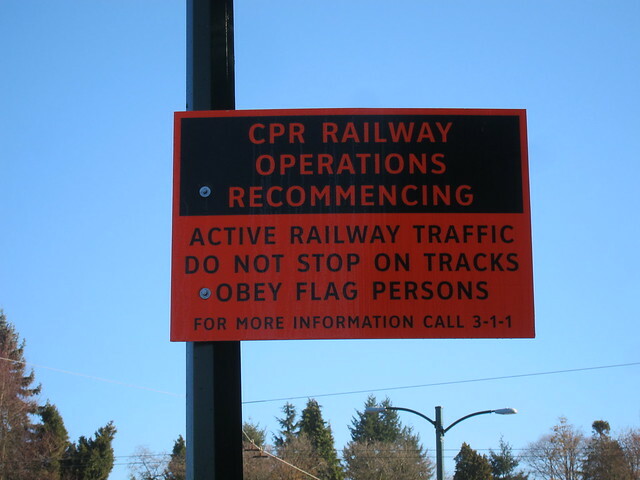 This sign, and more like it, was put up by the City of Vancouver along the Arbutus Corridor, in anticipation of the resumption of rail traffic along the CP railway line. Anyway, since these signs first appeared, no trains have run. So the sign is not necessary. In fact, redundant signs tend to reduce compliance with signs in general. Which is not a Good Idea. 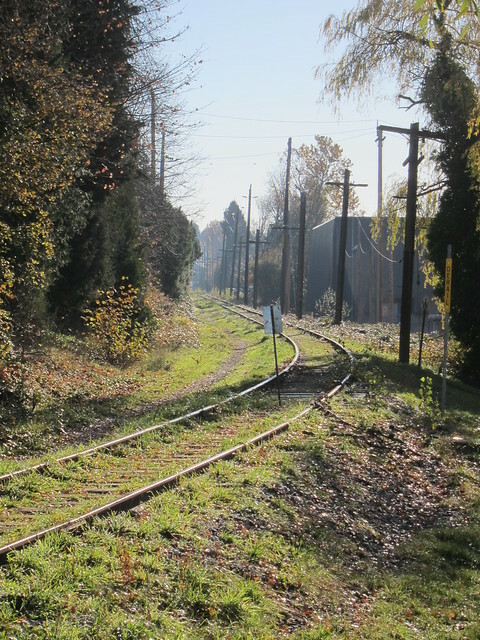 This image is taken looking south at the point where the line crosses King Edward. You will notice the post and sign in the middle of the tracks, put there by the contractor to show the limit of the refurbishment work they had performed. From here down to Marine Drive/Kent Avenue track had been lifted, ballst added and graded, ties replaced, level crossings cleaned and so on. 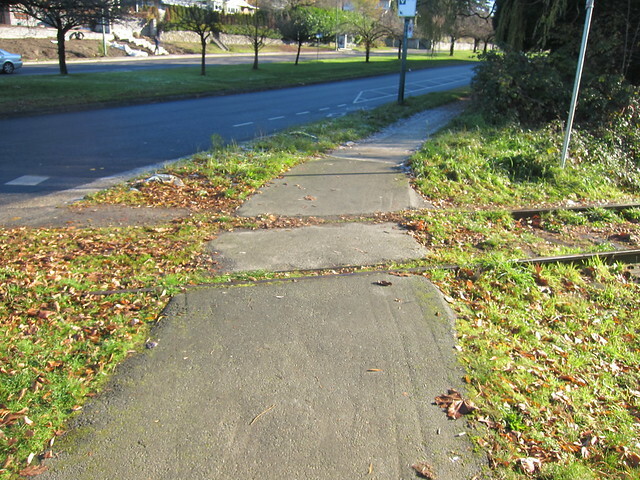 From this point north, only some desultory vegetation removal – plus the enthusiastic destruction of community gardens – had taken place. But it is clear from the state of the track that it could not support train operation in its current condition. At crossings south of this one, the flangeways have been cleared, and in some cases timbers inserted parallel to the rails to make subsequent cleaning easier. Obviously nothing was done here. On the other side of King Edward the blackberries are returning. From here northwards the track is once again dissapearing under the growth. CP were bluffing. You do not need the signs: you can start with the ones one King Ed and work north from there confident that no trains will run. It seems pretty unlikely that they will to the south either, but theoretically they could. I doubt they will. 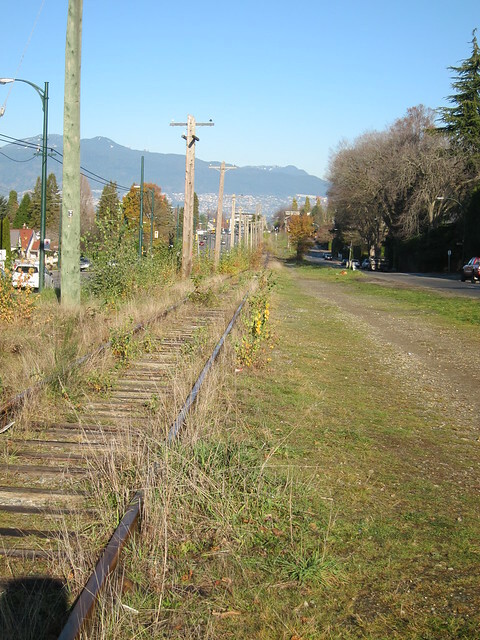 The City of Vancouver announced today that they had finally got a deal with CP to take over the line and turn it into a Greenway: the potential for future light rail in the longer term is not ruled out. This looks like the E & N Railway behind our house in Shawnigan Lake. 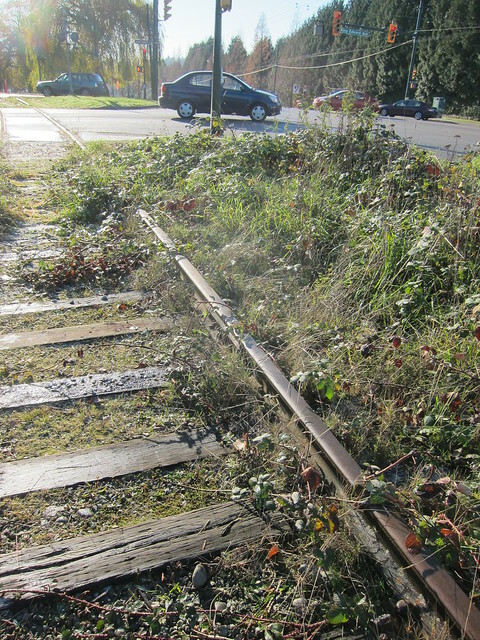 Its rails have seen nothing other than a few maintenance vehicles since 2008. I’m assuming the school buses, transit buses, and other buses have to turn on their four way flashers, open the driver’s window, open the front door, stop, look, and listen, close the doors, and then cross the tracks, and only then, turn the four way flashers off? The E&N stretches almost 250 km, and it touches the heart of every major city on the Island. It doesn’t take a nuclear physicist to see the potential for incrementally building up commuter and freight rail to today’s standards. I swear commuter rail will take off if they would link to the ferry terminals and tie improved local transit to the stations, perhaps with light rail. I suggest First Nations should be full partners from Day One in any effort to improve on the former rail service and in adjacent transit-oriented development, considering 8,000 km2 of their traditional territory was literally stolen from them and given to Robert Dunsmuir in the from of the E&N land grant. That occurred without treaties, legal representation and, with one exception, compensation. Most of that land remains private and in the hands of foretry companies.